SAS programmers employ the SAS software to program various functionalities. These professionals undertake the following work description mainly – customer intelligence, performance management, system solutions, business intelligence, risk management, and security intelligence. 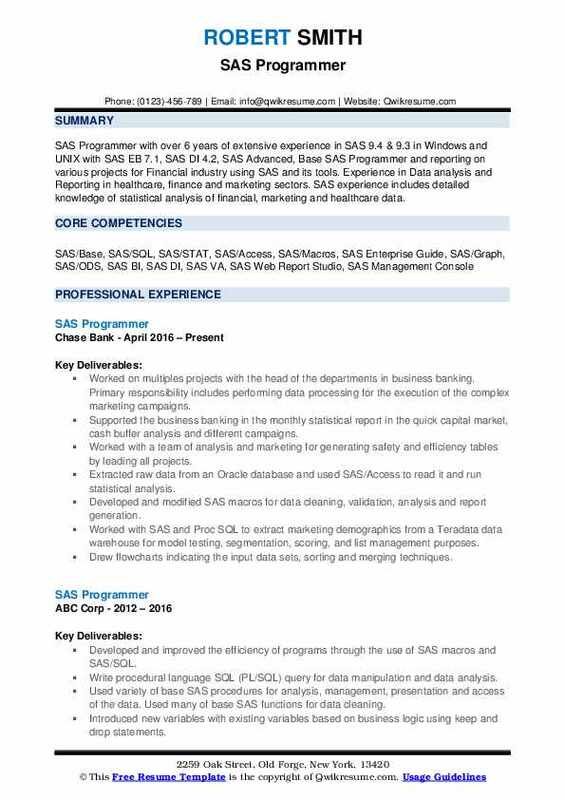 The other primary responsibilities for the SAS programmer include – building SAS datasets, developing SAS macros, utilities and templates; implementing analysis specified in SAS, writing SAS programs to generate figures, listings and tables; making statistical reports and studying management reports using SAS. 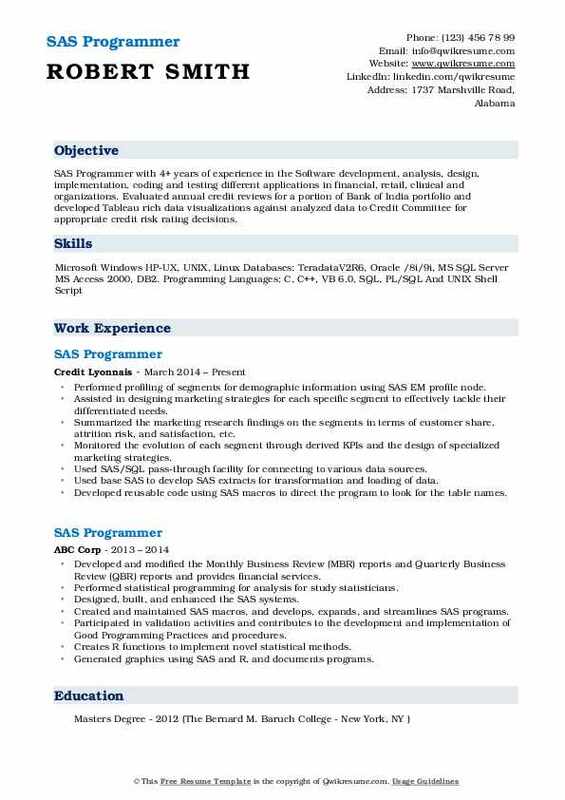 Typical SAS Programmer Resume makes a display of programming skills, time management, strong knowledge of SAS on Windows and UNIX platform, experience in various SAS report generation procedures and a good understanding of designing and implementing statistical reports. Successful SAS programmers normally hold a Bachelor’s degree in the field of Computer Science or Statistics. 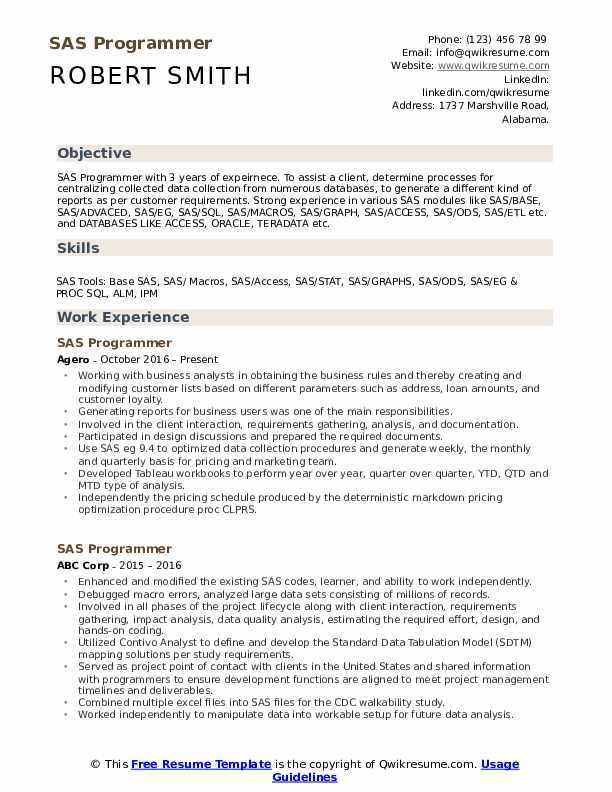 Objective : SAS Programmer with 3 years of expeirnece. To assist a client, determine processes for centralizing collected data collection from numerous databases, to generate a different kind of reports as per customer requirements. Strong experience in various SAS modules like SAS/BASE, SAS/ADVACED, SAS/EG, SAS/SQL, SAS/MACROS, SAS/GRAPH, SAS/ACCESS, SAS/ODS, SAS/ETL etc. and DATABASES LIKE ACCESS, ORACLE, TERADATA etc. Working with business analysts in obtaining the business rules and thereby creating and modifying customer lists based on different parameters such as address, loan amounts, and customer loyalty. Generating reports for business users was one of the main responsibilities. Involved in the client interaction, requirements gathering, analysis, and documentation. Participated in design discussions and prepared the required documents. Use SAS eg 9.4 to optimized data collection procedures and generate weekly, the monthly and quarterly basis for pricing and marketing team. Independently the pricing schedule produced by the deterministic markdown pricing optimization procedure proc CLPRS. Developed a set of SAS macros to verify independently the output produced by the earned value management analysis macros. Developed SAS programs with the use of base SAS and SAS/Macros to implement new models. Headline : SAS Programmer with over 6 years of extensive experience in SAS 9.4 & 9.3 in Windows and UNIX with SAS EB 7.1, SAS DI 4.2, SAS Advanced, Base SAS Programmer and reporting on various projects for Financial industry using SAS and its tools. Experience in Data analysis and Reporting in healthcare, finance and marketing sectors. 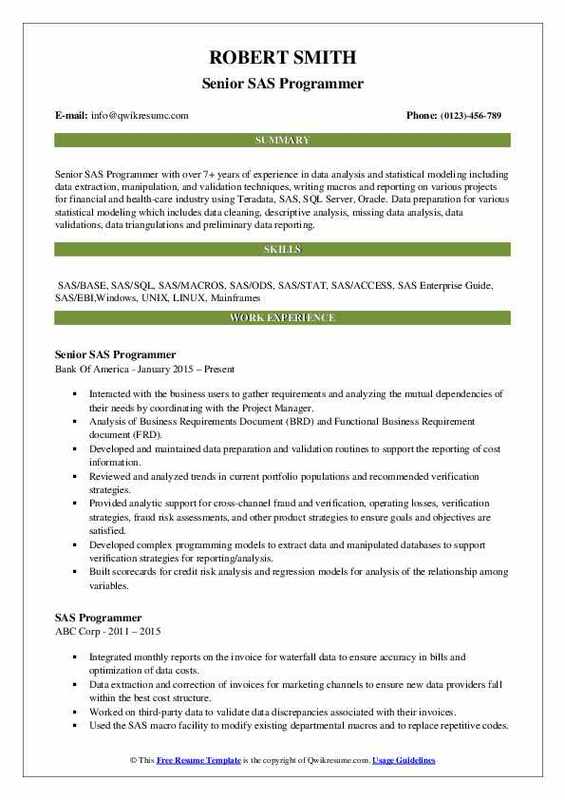 SAS experience includes detailed knowledge of statistical analysis of financial, marketing and healthcare data. Worked on multiples projects with the head of the departments in business banking. Primary responsibility includes performing data processing for the execution of the complex marketing campaigns. Supported the business banking in the monthly statistical report in the quick capital market, cash buffer analysis and different campaigns. Worked with a team of analysis and marketing for generating safety and efficiency tables by leading all projects. Extracted raw data from an Oracle database and used SAS/Access to read it and run statistical analysis. Developed and modified SAS macros for data cleaning, validation, analysis and report generation. Worked with SAS and Proc SQL to extract marketing demographics from a Teradata data warehouse for model testing, segmentation, scoring, and list management purposes. Drew flowcharts indicating the input data sets, sorting and merging techniques. Wrote code using SAS/base and SAS/macros to extract clean and validate data from a flat file, excel file, RDBMS, access database, and Oracle database using SAS ETL and DB load processes. Extensively using do loops, array, and SAS/stat to manipulate numerical data and scientific data. 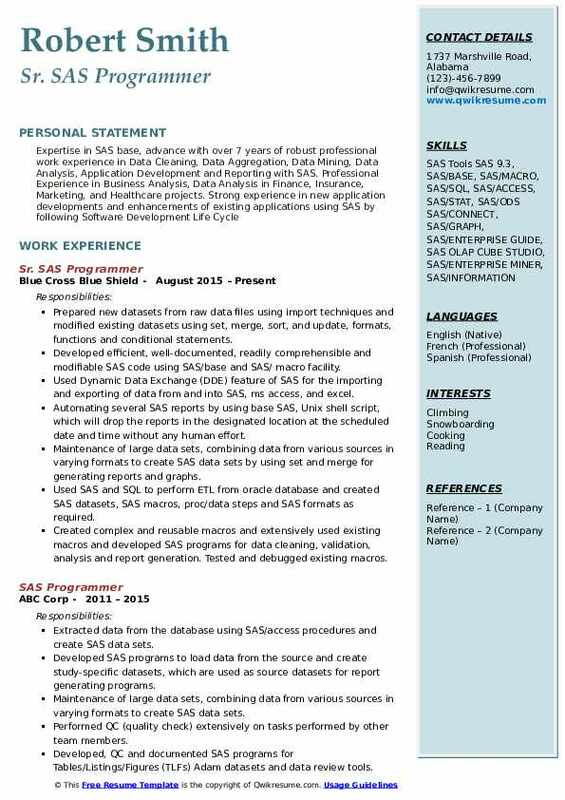 Summary : Senior SAS Programmer with over 7+ years of experience in data analysis and statistical modeling including data extraction, manipulation, and validation techniques, writing macros and reporting on various projects for financial and health-care industry using Teradata, SAS, SQL Server, Oracle. Data preparation for various statistical modeling which includes data cleaning, descriptive analysis, missing data analysis, data validations, data triangulations and preliminary data reporting. Interacted with the business users to gather requirements and analyzing the mutual dependencies of their needs by coordinating with the Project Manager. Analysis of Business Requirements Document (BRD) and Functional Business Requirement document (FRD). Developed and maintained data preparation and validation routines to support the reporting of cost information. Reviewed and analyzed trends in current portfolio populations and recommended verification strategies. Provided analytic support for cross-channel fraud and verification, operating losses, verification strategies, fraud risk assessments, and other product strategies to ensure goals and objectives are satisfied. Developed complex programming models to extract data and manipulated databases to support verification strategies for reporting/analysis. Built scorecards for credit risk analysis and regression models for analysis of the relationship among variables. Developed product and cross-product simulations, business logic, and pricing strategies to optimize profitability. Maintained a tracking system for all marketing channels and generated client report in order to make business decisions. 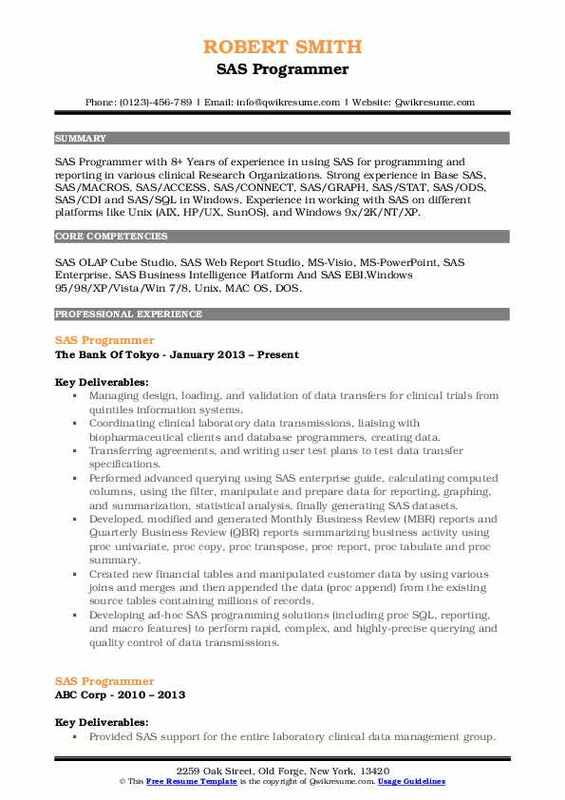 Summary : Over 7 plus years of extensive experience in SAS statistical analysis/programming in Windows environment. Certified in BASE SAS & ADVANCED SAS. Thorough & Working knowledge of PYTHON, both Scripting & Programming. Extensive experience in SAS PC in Windows Environment. Extensive experience working with SAS SQL, MS EXCEL & MS ACCESS. Thorough understanding of SAS-VMS (Virtual Memory System). Involved in programmer modifications and report generation for phase iii-iv clinical studies. Generated analysis datasets for interim analysis, final CSRS, and medical team requests. Extensively worked on the creation of analysis datasets like demographics, lab safety and lab efficacy, vital signs safety and efficacy, adverse events, protocol deviations, study drug dosing etc. Generated edit check listings to help clean the data (data cleaning and verification) on a regular basis of data refresh. Involved in creating Dataset Specifications (DSS) for creating analysis datasets. Imported data from excel documents to SAS datasets using Dynamic Data Exchange (DDE) utility. Created SAS macros for generating similar types of tables and listings for demographic, disposition, different types of adverse events, lab shift, vital signs shift, lab marked abnormalities, the extent of exposure, time to an event etc. Validated (QC) and documented the competing codes for datasets and reports. Prepared new datasets from raw data files using import techniques and modified existing datasets using set, merge, sort, and update, formats, functions and conditional statements. Developed efficient, well-documented, readily comprehensible and modifiable SAS code using SAS/base and SAS/ macro facility. Used Dynamic Data Exchange (DDE) feature of SAS for the importing and exporting of data from and into SAS, ms access, and excel. Automating several SAS reports by using base SAS, Unix shell script, which will drop the reports in the designated location at the scheduled date and time without any human effort. Maintenance of large data sets, combining data from various sources in varying formats to create SAS data sets by using set and merge for generating reports and graphs. Used SAS and SQL to perform ETL from oracle database and created SAS datasets, SAS macros, proc/data steps and SAS formats as required. Created complex and reusable macros and extensively used existing macros and developed SAS programs for data cleaning, validation, analysis and report generation. Tested and debugged existing macros. Headline : SAS Programmer with 4+ years of experience in the Software development, analysis, design, implementation, coding and testing different applications in financial, retail, clinical and organizations. Evaluated annual credit reviews for a portion of Bank of India portfolio and developed Tableau rich data visualizations against analyzed data to Credit Committee for appropriate credit risk rating decisions. Performed profiling of segments for demographic information using SAS EM profile node. Assisted in designing marketing strategies for each specific segment to effectively tackle their differentiated needs. Summarized the marketing research findings on the segments in terms of customer share, attrition risk, and satisfaction, etc. Monitored the evolution of each segment through derived KPIs and the design of specialized marketing strategies. Used SAS/SQL pass-through facility for connecting to various data sources. Used base SAS to develop SAS extracts for transformation and loading of data. Developed reusable code using SAS macros to direct the program to look for the table names. Performed data analysis, statistical analysis, generated reports, listings and graphs using SAS tools such as SAS/base, SAS/Macros, SAS/Graph, SAS/SQL, and SAS/connect. Extensively used set, update and merge statements for creating, updating and merging various SAS datasets. Created and maintained SAS data sets that are extracted from an Oracle database. 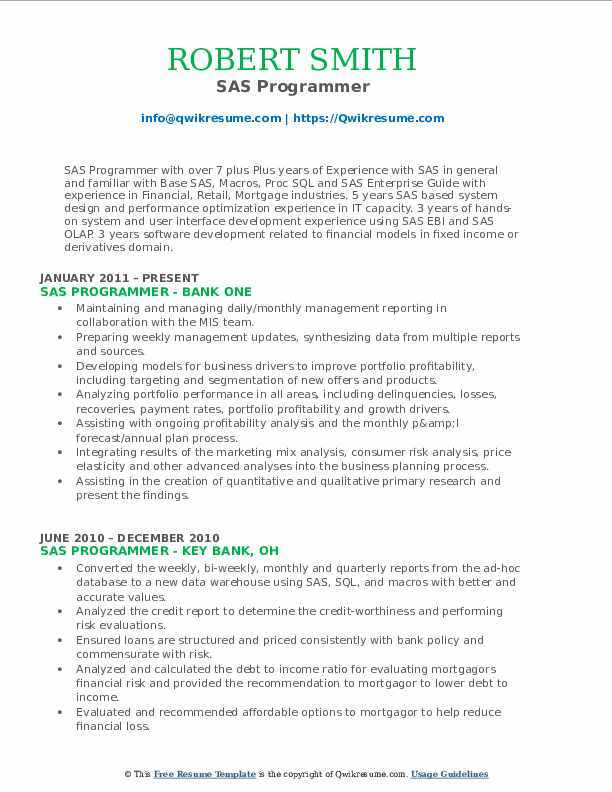 Summary : SAS Programmer with over 7 plus Plus years of Experience with SAS in general and familiar with Base SAS, Macros, Proc SQL and SAS Enterprise Guide with experience in Financial, Retail, Mortgage industries. 5 years SAS based system design and performance optimization experience in IT capacity. 3 years of hands-on system and user interface development experience using SAS EBI and SAS OLAP. 3 years software development related to financial models in fixed income or derivatives domain. Maintaining and managing daily/monthly management reporting in collaboration with the MIS team. Preparing weekly management updates, synthesizing data from multiple reports and sources. Developing models for business drivers to improve portfolio profitability, including targeting and segmentation of new offers and products. Analyzing portfolio performance in all areas, including delinquencies, losses, recoveries, payment rates, portfolio profitability and growth drivers. Assisting with ongoing profitability analysis and the monthly p&l forecast/annual plan process. Integrating results of the marketing mix analysis, consumer risk analysis, price elasticity and other advanced analyses into the business planning process. Assisting in the creation of quantitative and qualitative primary research and present the findings. Working closely with different marketing groups in designing and analyzing the data. 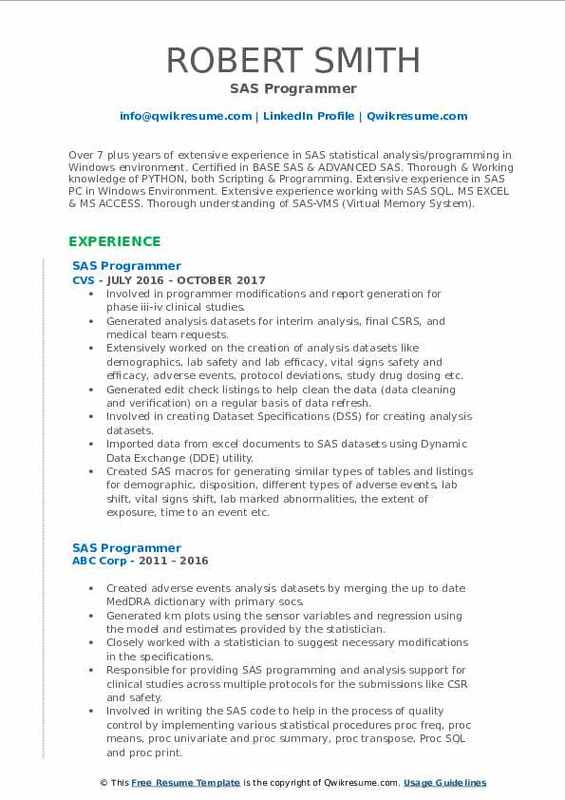 Summary : SAS Programmer with 8+ Years of experience in using SAS for programming and reporting in various clinical Research Organizations. Strong experience in Base SAS, SAS/MACROS, SAS/ACCESS, SAS/CONNECT, SAS/GRAPH, SAS/STAT, SAS/ODS, SAS/CDI and SAS/SQL in Windows. Experience in working with SAS on different platforms like Unix (AIX, HP/UX, SunOS), and Windows 9x/2K/NT/XP. Skills : SAS OLAP Cube Studio, SAS Web Report Studio, MS-Visio, MS-PowerPoint, SAS Enterprise, SAS Business Intelligence Platform And SAS EBI.Windows 95/98/XP/Vista/Win 7/8, Unix, MAC OS, DOS. Managing design, loading, and validation of data transfers for clinical trials from quintiles information systems. Coordinating clinical laboratory data transmissions, liaising with biopharmaceutical clients and database programmers, creating data. Transferring agreements, and writing user test plans to test data transfer specifications. Performed advanced querying using SAS enterprise guide, calculating computed columns, using the filter, manipulate and prepare data for reporting, graphing, and summarization, statistical analysis, finally generating SAS datasets. Developed, modified and generated Monthly Business Review (MBR) reports and Quarterly Business Review (QBR) reports summarizing business activity using proc univariate, proc copy, proc transpose, proc report, proc tabulate and proc summary. Created new financial tables and manipulated customer data by using various joins and merges and then appended the data (proc append) from the existing source tables containing millions of records. Developing ad-hoc SAS programming solutions (including proc SQL, reporting, and macro features) to perform rapid, complex, and highly-precise querying and quality control of data transmissions. 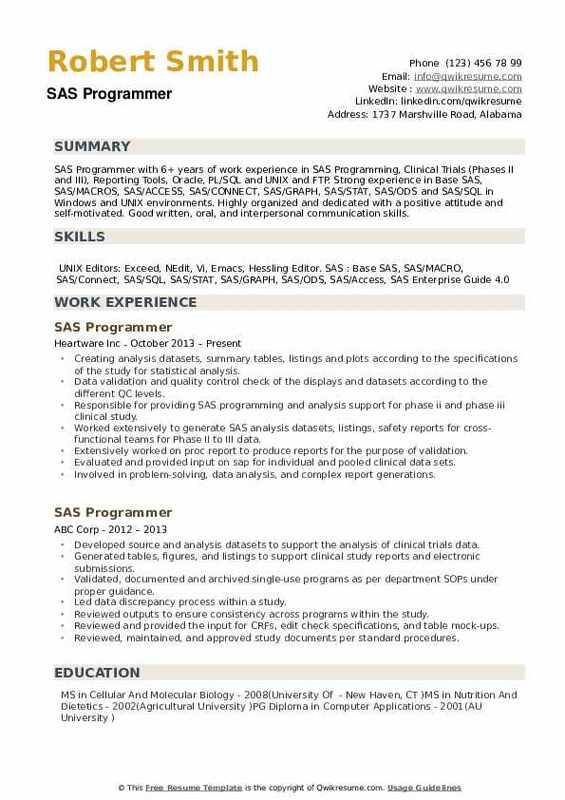 Summary : Certified SAS Base Programmer with overall seven years of experience in analysis, development, implementation of statistical models and applications in the Pharmaceutical and Biotech industry. SAS programming experience with Data Migration, Validation, Statistical analysis Procedures, Output Delivery System, Macros, Flowchart Design, Ad-Hoc Listing, Summarizing and Reporting procedures and Graphs. Created safety and efficacy Analysis/derived Data Sets from raw data sets. Performed databases cleaning and validation using SAS procedures, macros. Involved in clinical trials, data migration/extraction from flat files and SAS datasets. Worked closely with data management, clinical and statistical personnel to clean inbound data from monitoring sites developed and tested programs for safety and efficacy to support the clinical trial management team. Generated ad-hoc reports for analysis datasets using procedures print and. Used SAS/ODS for delivering output in different formats including HTML. Maintained the standards for dates and country along with other CDISC. Involved in designing, implementation, and validation of SAS programs to produce descriptive/categorical statistical analysis for clinical studies. Created SAS analysis datasets from raw data sets while adhering to the guidelines. Created clinical trial data listing and summary tables - demographic, adverse events, serious adverse events, vital, ECG, plasma concentration. 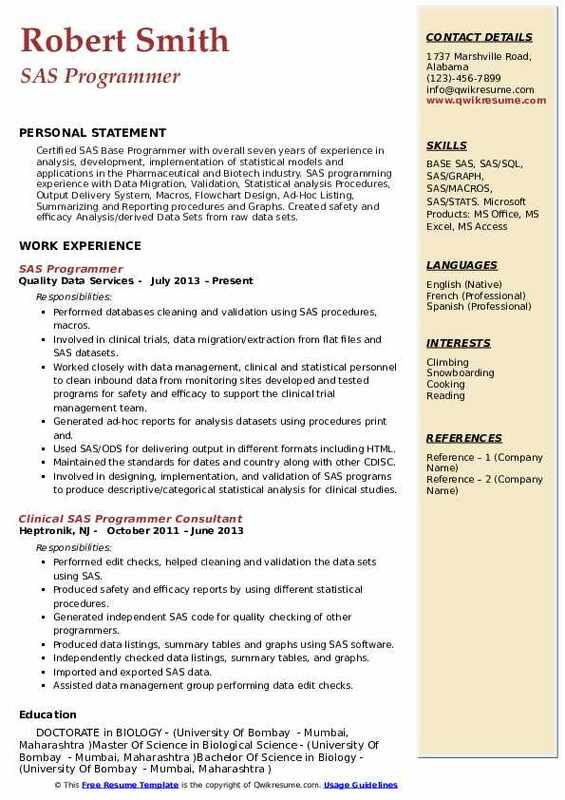 Headline : SAS Programmer with 6+ years of work experience in SAS Programming, Clinical Trials (Phases II and III), Reporting Tools, Oracle, PL/SQL and UNIX and FTP. Strong experience in Base SAS, SAS/MACROS, SAS/ACCESS, SAS/CONNECT, SAS/GRAPH, SAS/STAT, SAS/ODS and SAS/SQL in Windows and UNIX environments. Highly organized and dedicated with a positive attitude and self-motivated. Good written, oral, and interpersonal communication skills. Creating analysis datasets, summary tables, listings and plots according to the specifications of the study for statistical analysis. Data validation and quality control check of the displays and datasets according to the different QC levels. Responsible for providing SAS programming and analysis support for phase ii and phase iii clinical study. Worked extensively to generate SAS analysis datasets, listings, safety reports for cross-functional teams for Phase II to III data. Extensively worked on proc report to produce reports for the purpose of validation. Evaluated and provided input on sap for individual and pooled clinical data sets. Involved in problem-solving, data analysis, and complex report generations. Developed various forms of outputs, RTF, PDF, HTML files using SAS ods facility. Experienced in SAS edit checks with automated quarry generation and validate clinical datasets.